Earlier this month Baseball Hall of Fame officials allowed a New York auction house to sell off a letter suspected to have been stolen from the National Baseball Library’s famous August Herrmann Papers Collection. Hall officials did not request the auctioneer to stop the sale of the letter, addressed to Cincinnati Reds owner, August Herrmann, nor did they make a claim of ownership. 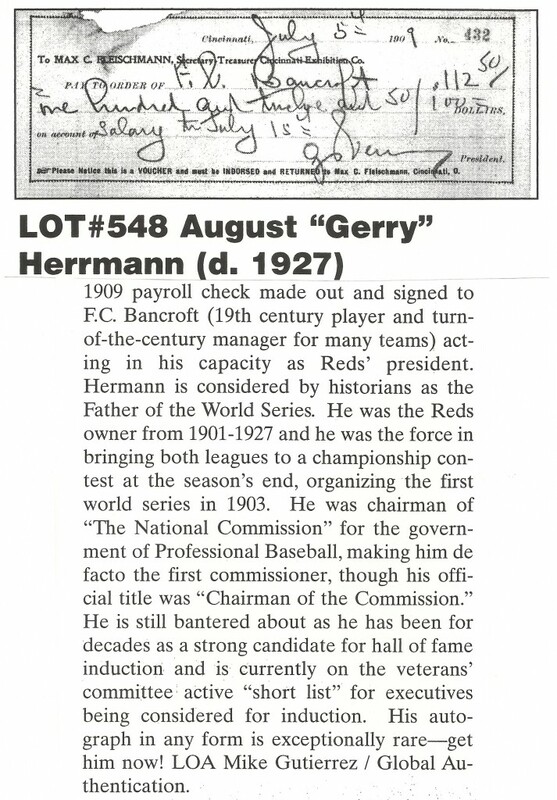 Instead, Hall of Fame spokesperson, Brad Horn, told Clean Sweep Auctions that they could not definitively determine if the document came from their collection, even though the Herrmann Papers archive includes over 45,000 documents that constitute what appears to be the entire personal and business correspondence of Herrmann from the turn-of-the-century through the late 1920s. 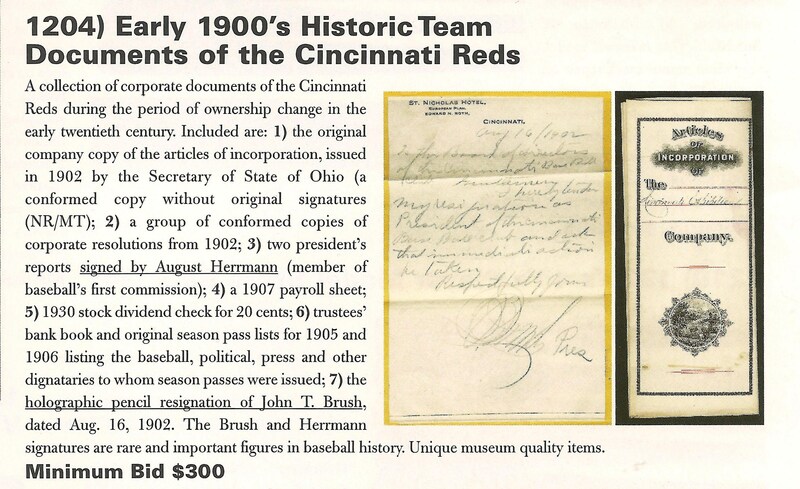 The August Herrmann Papers archive at the National Baseball Library features similar financial documents related to the Reds franchise at the turn of the century. 1902 Note signed by John T. Brush, from the Hall of Fame's Herrmann Papers collection. 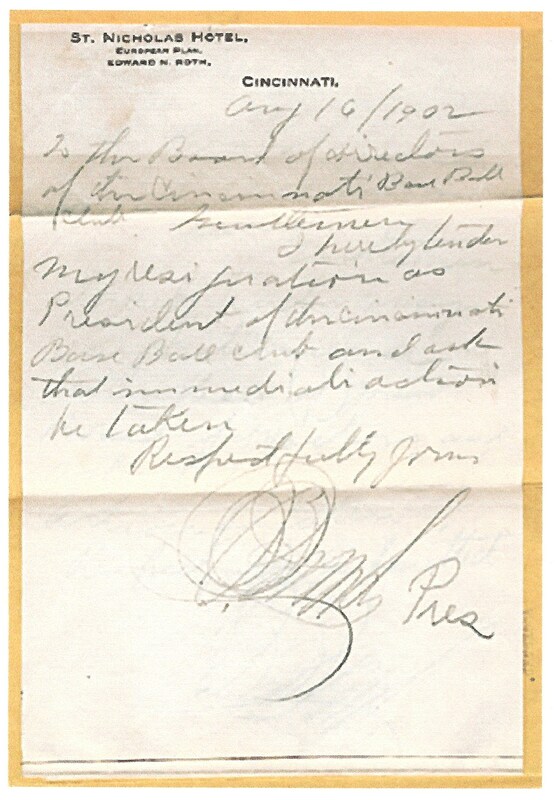 August 15, 1902 promisory note signed by John T. Brush that sold at REA in 2008. How could the August 23, 1902 document be part of the Hall of Fame collection, and the other two notes be up for sale in public auction? Can the Hall of Fame explain why they are not in the collection and can the sellers prove where the documents originated? The Herrmann Archive was donated to the Hall by Reds owner Powel Crosley Jr. in 1960 and the National Baseball Library conserved and catalogued the entire Herrmann archive in 2005, thanks to a grant from the Yawkey Foundation. The library prepared a detailed guide describing the contents of each of the 150 boxes of documents in the collection and each box has its enclosed folders designated by name, date and subject. 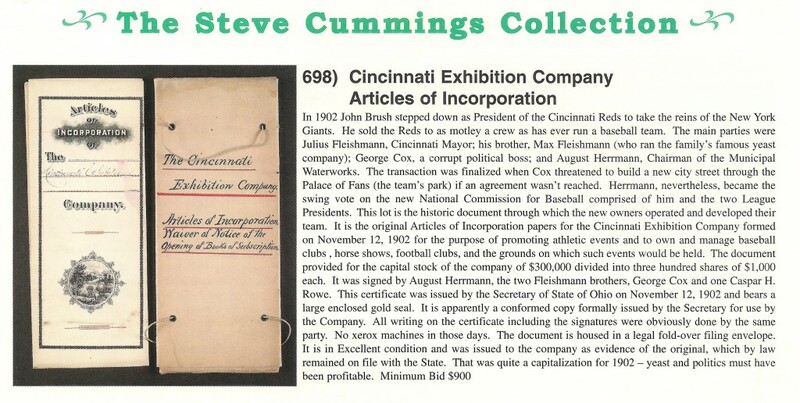 This lot of "Historic Team Documents of the Cincinnati Reds" sold at MastroNet in 2001. This page from the Hall of Fame's Herrmann Papers Guide shows the scope of the business documents included in the collection. The Cincinnati Reds' articles of incorporation with a certificate dated November, 12, 1902 sold in a Mastro Auction in 1998. 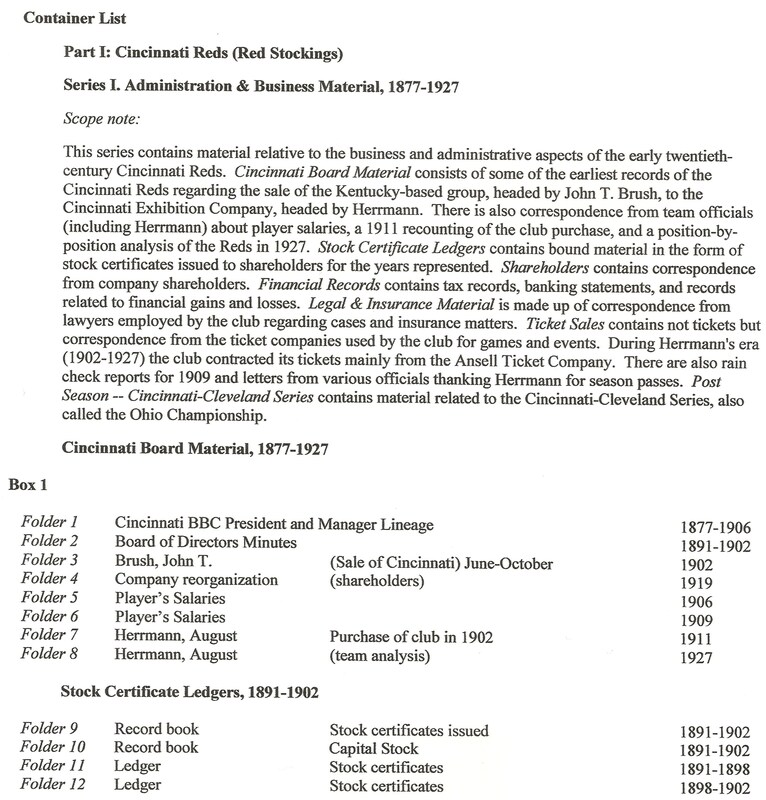 Folder 3, Box 1 of the HOF's Herrmann Papers archive includes documents regarding: "Sale of Cincinnati June-Oct. 1902." Folder 2 includes "Board of Directors Minutes, 1891-1902." 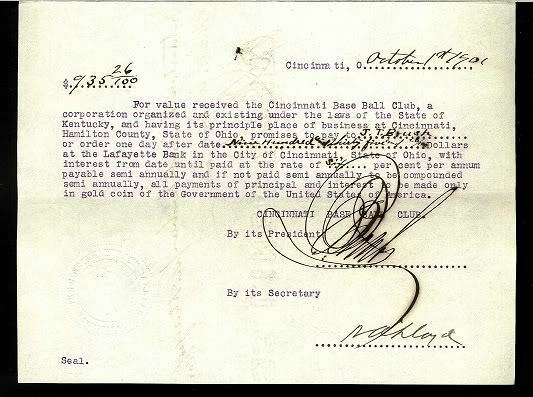 This $146,462.34 check was used by August Herrmann to buy the Cincinnati Reds. 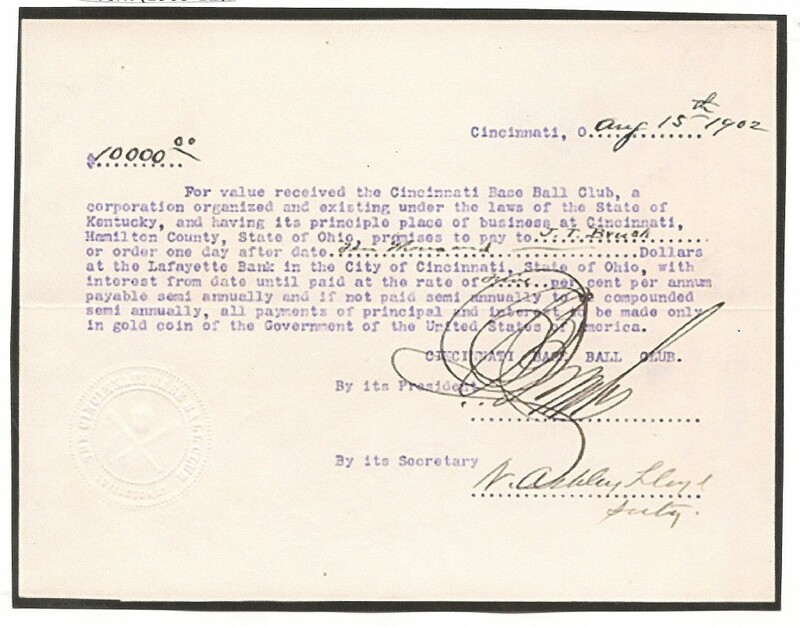 Box 1, Folder 3, includes documents related to the "Sale of Cincinnati" including the agreement that references this very check. This 1909 Cincinnati Red cancelled payroll check may have originated from a Herrmann Papers file dedicated to "Player Salaries, 1909"
This Cincinnati Reds payroll receipt signed by Miller Huggins is suspected to have originated from the Herrmann Papers archive. 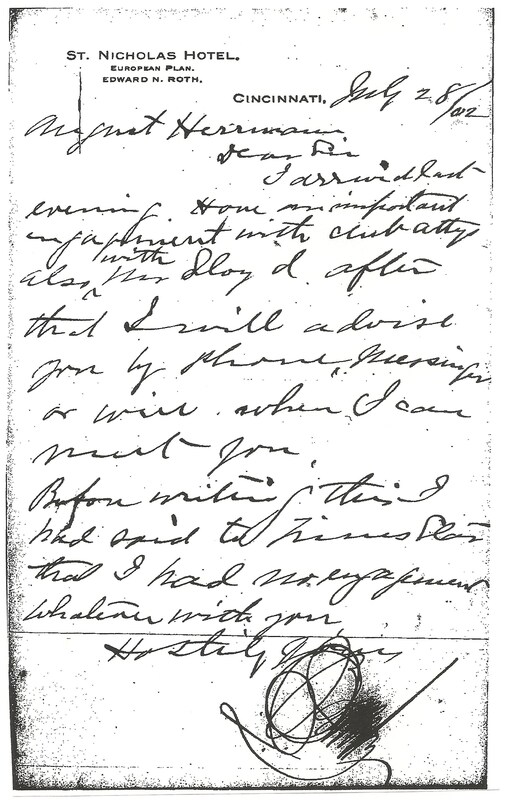 This 1902 resignation letter from Brush to Herrmann and his partners is dated just weeks after a similar letter from Brush that is part of the HOF's Herrmann archive. This 1902 letter from John T. Brush to August Herrmann is part of the HOF's Herrmann Papers archive. Over the past several decades, documents both confirmed stolen and suspected stolen from the Herrmann papers archive have sold publicly and privately in the baseball collectibles marketplace. To date, neither the Hall of Fame, nor any seller of these documents has been able to establish a legitimate secondary source of August Herrmann’s personal papers. 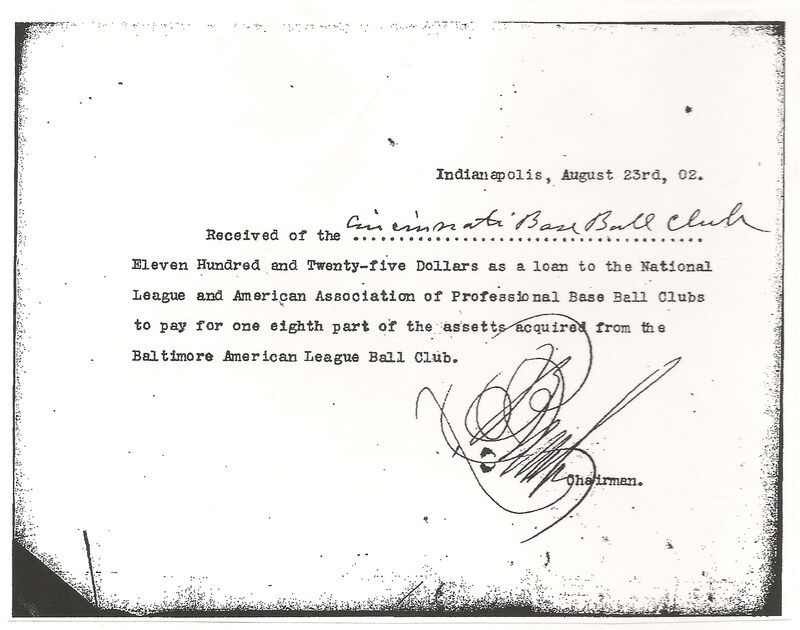 Based upon the many confirmed instances of theft from the National Baseball Library, it would appear the burden of proof would lie with the sellers of these suspect documents to prove where their documents originated. As a public trust and caretaker of donated materials, the Baseball Hall of Fame and Museum has a responsibility to pursue recovery of artifacts stolen from their collections. How can the Baseball Hall of Fame properly determine what has been wrongfully removed from their great collection if they have not thoroughly investigated the issue themselves? Update: We have been informed that the present seller of the John Brush signed note on EBAY acquired it from another dealer who originally purchased the item from another EBAY auction in 2007. I wish the Hall of Fame would challenge auctioneers to state publicly where they obtained the documents that the Hall surely suspects belong to its archive. Why does it permit sales of items like these? This ebay seller is tempting fate as it is not the first time he is offering stolen material. Here we go again, more stuff up for grabs ,that were mysteriously removed from the HOF, by unknown people.Now, lets take a good look at all of this stuff, that has been removed and discovered all of a sudden.Could it be possible that it is a inside job and the proceeds are lining someones pocket employed there ?? Is it possible that someone employed there is removing these items them selves, for the same purpose. Is it possible that the person banned from the HOF,for previously removing items ,has in fact took them ? There are many variables here that are could be,s.But one thing for sure,someone in the HOF knows what is going on ????? ?